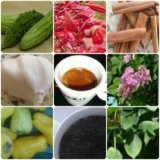 How Can I cure my Type-1 Diabetes by ayurveda or in natural way? QUESTION: I am Vishu 21 yrs. old from India, in February 2010 I've met with an lung infection. I eat sweets, drink cold drink but my sugar level doesn't go up. At starting my blood glucose was 460; but now before meal my blood glucose is around 70-100 and after meal is 110-180. At starting my insulin dose was 30 in morning and 20 at night; but now it is 6 in morning and 3 at night. Even after eating sweet or sugar my blood glucose doesn't go up; please help me I am unable to understand what is happening with me. First, sorry for the uncomfortable situation you are in, and congrats for the knowledge you are seeking to understand what happens to you. Infection (including lung infections) are one of the signals for the existence of diabetes (including type 1). Most probably your type 1 diabetes is inherited, and would come out one day or another. Insulin is the only drug indicated for type 1 diabetics. As I see from your levels of blood sugar levels, they do not seem high. This indicates that you are controlling your diabetes well or insulin is giving effect. However, you must talk to your doctor to lower (or adjust) the doses of insulin shots according to your body needs. Dietary changes are also important to combat your diabetes. Try not to eat sweets or carbonated drinks (that are high in glycemic index); you can have fruit juices freshly squeezed (orange, apples, berries) or mix with vegetables (carrots, celery, fenugreek, cinnamon). Implementing other good lifestyle changes (no alcohol, no smoking, exercise, etc) are also important in beating your diabetes naturally. I regret to tell you that once diagnosed with type 1 diabetes, you can only control it; the cure (which includes stem cells) is not sure yet. There are people who have controlled diabetes very well with the dietary, lifestyle changes and supplements taking at that point they need only small doses of insulin (until 1 doses per day). sir thank you for your help and making me clear about what was done to me and sir please tell me is their any other treatment for type-1 diabetes instead of insulin shots. Although you have type 1 diabetes, you should eat from any type of foods, but in moderation. Fruits and vegetables are the most preferable together with fish and chicken or turkey breast. Other meat like red meat, is preferable to eat in limitation. Whole grains and olive oil are other selected foods for type 1 diabetics, which are included in the Mediterranean diet. However, keep in mind that food alone won't help you much if you do not exercise, or follow other lifestyle changes.